preheat oven to 160°C. line a muffin pan with paper cases. mix ground oreos and butter, divide mixture among paper cases and press down well. bake for 5 minutes, then remove and cool. mash the raspberries and strain through a sieve. discard seeds and stir in the icing sugar. beat cream cheese until light and fluffy, then add sugar slowly, beating until combined. add eggs, one at a time, beating well after each addition. (optionally add lime zest and lime juice – in this case adjust sugar to taste). 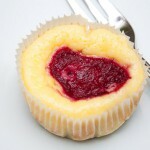 pour cheese mixture over the biscuit bases, then place drops of the fruit puree on top of the cakes. bake for 10-15 minutes until set. open oven door and allow cakes to cool completely in switched-off oven. 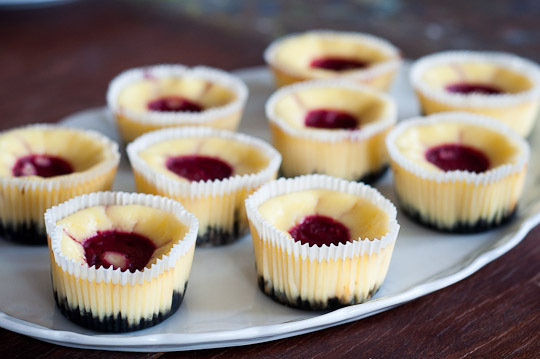 ps: i’m submitting these cheesecakes to the next round of cucina rapida. 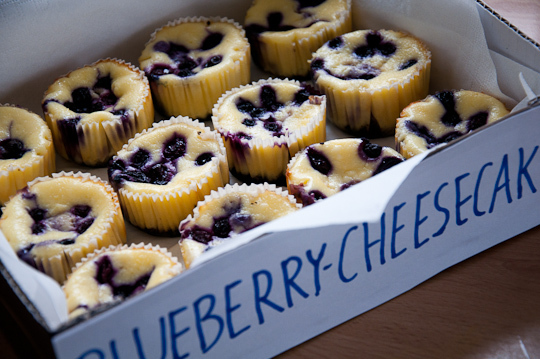 pps: for the blueberry version, just use frozen blueberries instead of raspberry puree. Deliziös, ich kann mich kaum zurückhalten. Danke für die Teilnahme am Event.